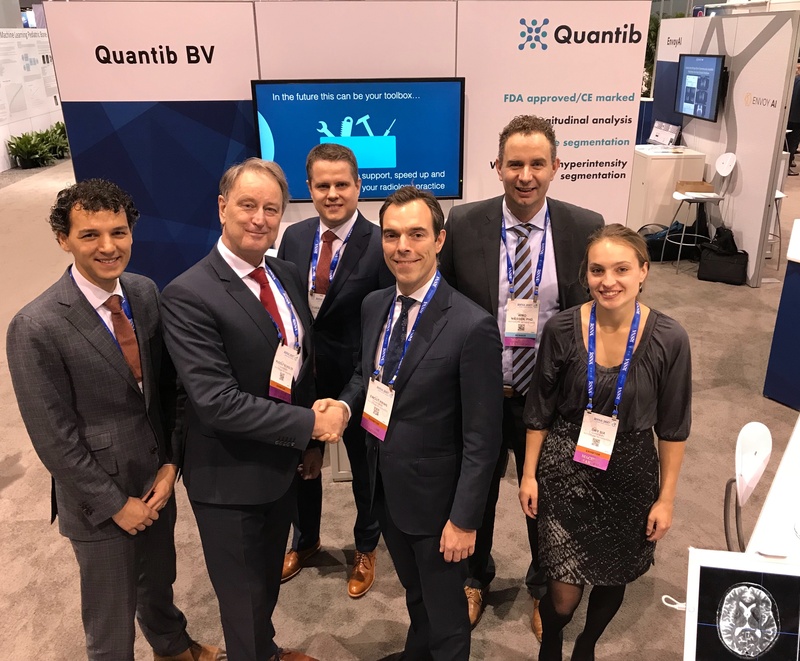 Chicago, 27 November 2017 – At the world’s largest radiology conference (RSNA), medical AI company Quantib announced today that it secured €4.5mln ($ 5.4mln) of fresh funding in a round that was lead by Holland Venture and InnovationQuarter. Quantib develops Machine Learning (ML) applications for medical imaging analyses, allowing physicians and researchers to make more efficient and more accurate diagnoses. The investment supports Quantib with her international scale-up ambitions. Founded in 2012 and headquartered in Rotterdam, The Netherlands, Quantib is one of the most renowned Dutch players in the field of medical AI applications. Quantib utilizes ML software for the segmentation, classification and quantification of medical images, improving diagnostic quality and allowing for a more efficient workflow of physicians and researchers. Quantib is a spin-off of the Erasmus MC, developing her products in close collaboration with the internationally recognized Biomedical Imaging Group Rotterdam (BIGR) under supervision of Prof. dr. Wiro Niessen. Moreover, Quantib has strong partnerships with industry players (GE Healthcare, Philips and Intrasense) for research, development and the distribution of her products. Recently, Quantib received media coverage as winner of The Dutch Data Science prize. Quantib’s first products received FDA approval and CE marking in 2016 and focus on the detection and tracking of neurological disorders such as Parkinson, Multiple Sclerosis and Alzheimer’s disease. The investment allows Quantib to bring new ML applications to the market with regards to stroke, lung disorders, oncology and bone structures. Quantib will also establish new partnerships with leading international academic hospitals. In conjunction with the investment, the management team has been reinforced with Arthur Post Uiterweer (former Philips and Boston Consulting Group) and Jorrit Glastra (former Shell). The supervisory board will consist of Prof. dr. Gabriel Krestin, Harm-Jan Wessels and health entrepreneur Jaap Maljers. “Quantib’s applications help standardise and speed up image analysis and allows for the detection of subtle changes over time. It increases the objectivity of the diagnostic process and therefore delivers an improved diagnosis combined with more efficient processes, positively impacting a large group of patients. We see large international growth opportunities for the company and we are proud to be a part of this development.” says Ewout Prins, Managing Partner Holland Venture.